The cookie itself is very light and moist but not too wet, with a strong vanilla note. In short, it is a fine example of the classic biscuit français. 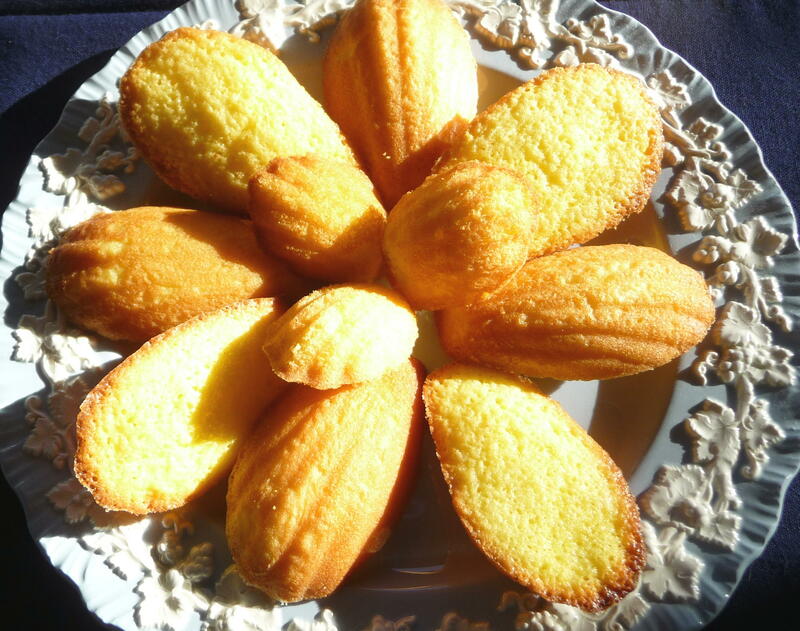 The proportions of the recipe vary from other madeleine recipes I have made (e.g., more eggs, less butter, less sugar), yet the result is light, springy, and tender, with plenty of flavour. 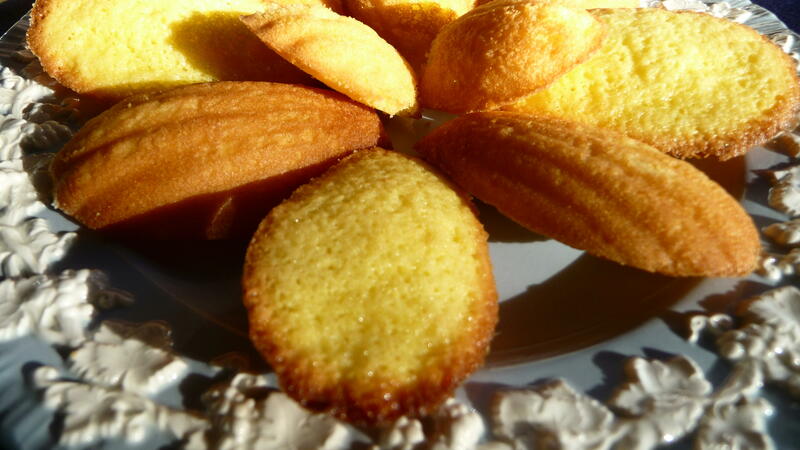 Channeling Jessie, I served the madeleines on a plate of hers, a classic blue-and-white Wedgwood dish before I realized the irony of a cookie emblematic of France on china, which is quintessentially British. Jessie would not have cared about that international rivalry, I am sure. This cookie is in keeping with Jessie’s love of baking, sweets, and France – not to mention its usefulness in prompting memories and a joy to savour, so this madeleine is a multi-purpose wonder. Pre-heat oven to 375 degrees, positioning the rack on the lower-middle rung. Grease and flour madeleine pans thoroughly (my miniatures stuck a bit the second round, and if you are worried, you can follow the extra-careful technique of melting additional butter, brushing it in the pans, flouring, placing in the fridge or freezer for a few minutes, and repeating once before filling. Mix eggs and sugar in the bowl of a stand-mixer (preferably), using the paddle attachment for seven minutes on level six (on my KitchenAid, that was the right setting). This can be done with an electric handmixer or, if you are really ambitious, with a whisk, by hand; it will take much longer. 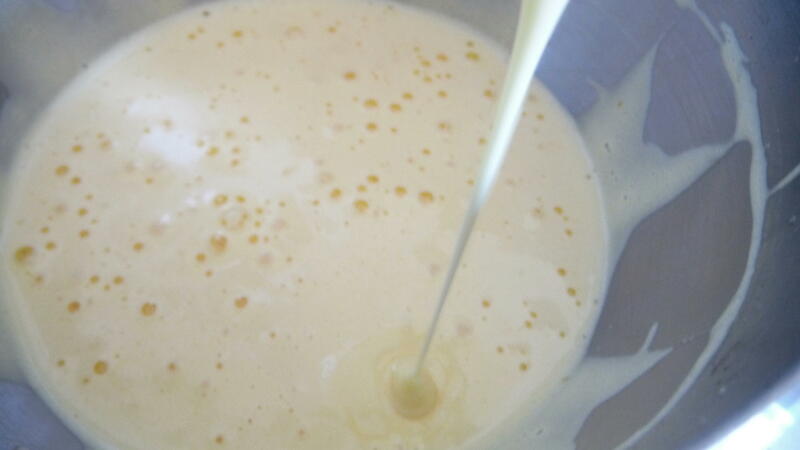 When the egg-sugar mixture become pale and double in volume (making a ribbon when the batter is dropped from a spoon back into the batter), add vanilla, on the lowest setting. Or else, whisk in the vanilla. Still on lowest setting, alternate butter and flour in three additions, until just blended, being careful not to overbeat. Manually, you could use a spatula for folding. Fill the prepared pans just below the rim of the form. 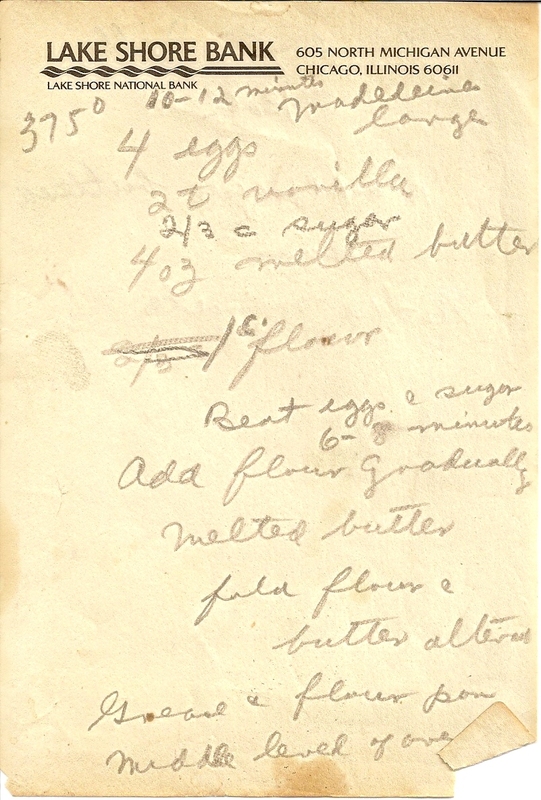 Bake until the edges are a rich golden brown (about eight minutes for minis, 10 minutes for the large). Enjoy with a cup of tea or other favourite beverage…be prepared for memories to flood back. 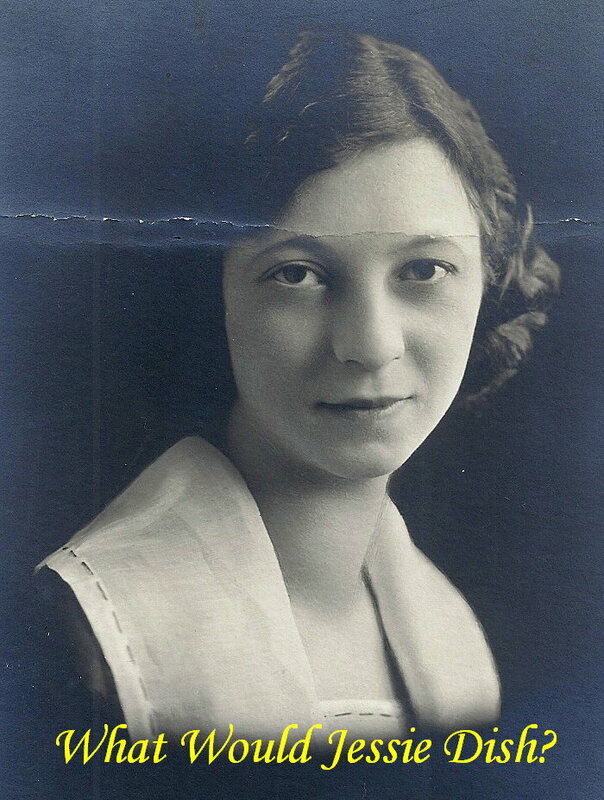 This entry was posted in Baking, Cookies, Dessert, Recipes Misc, What Would Jessie Dish and tagged Cookie, French, Madeleines, Vintage Recipes, WWJD. Bookmark the permalink. 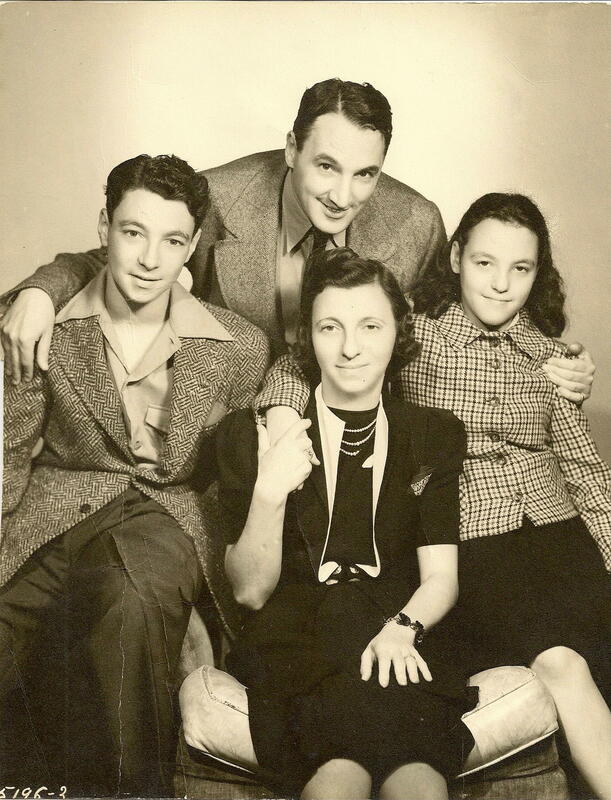 Beautiful photograph with the cherries and I loved the old family photos. What a find to have her recipes! I keep my grandmother’s recipe box in my kitchen and framed one of her all-time classics for my wall. I love reading it in her hand writing. Nice blog…just starting my own (sweetandcrumby.com) and was amazed how easily yours cam up in the Tag Surfer section. Any tips? Thank you! Thanks, Geni. Your comments are very encouraging, and I enjoyed stopping by your new blog, where I left you some advice. 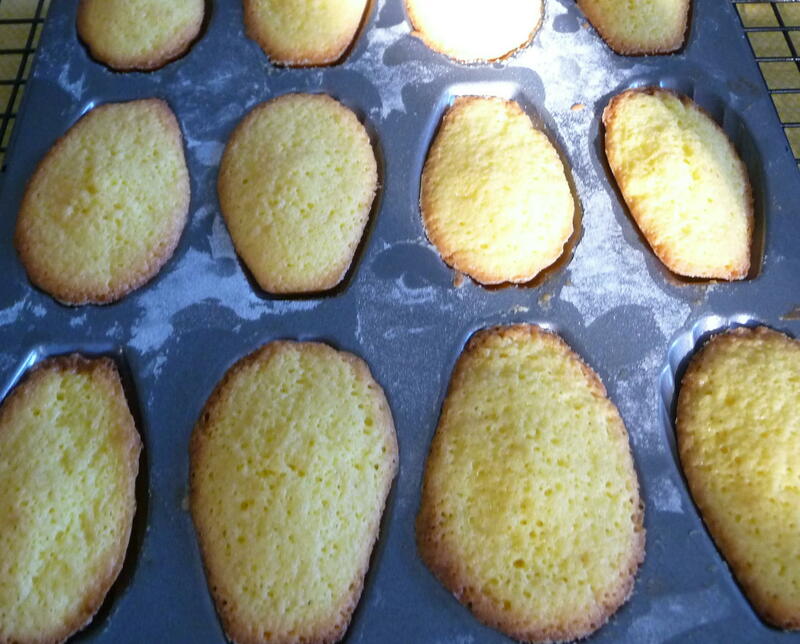 Mmm madeleines! I wish I could make some too, but my tiny kitchen just doesn’t have room for another baking pan right now… maybe someday though. I’m familiar with “A la recherche…” : ) Read it way back in college. I just came from the supermarket with my parents and they almost fainted when they saw the price @ US $10/kg. 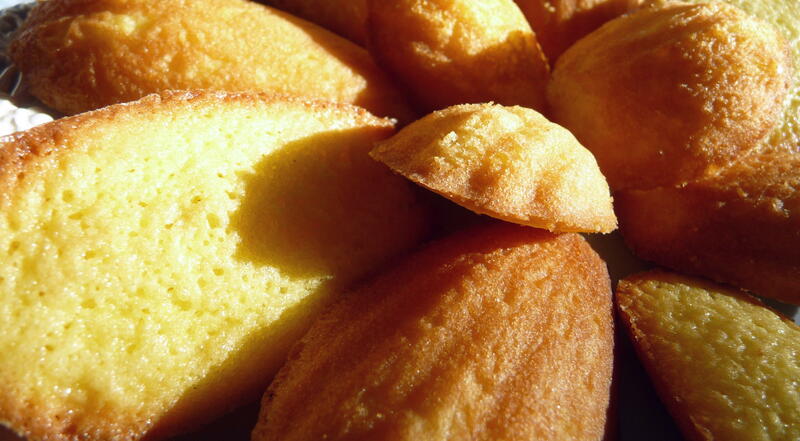 Madeleines and Proustian memories. Nice post. Hi, KM. Thanks so much for your kind words. I’m glad you read Proust – I still have to complete it en francais…. 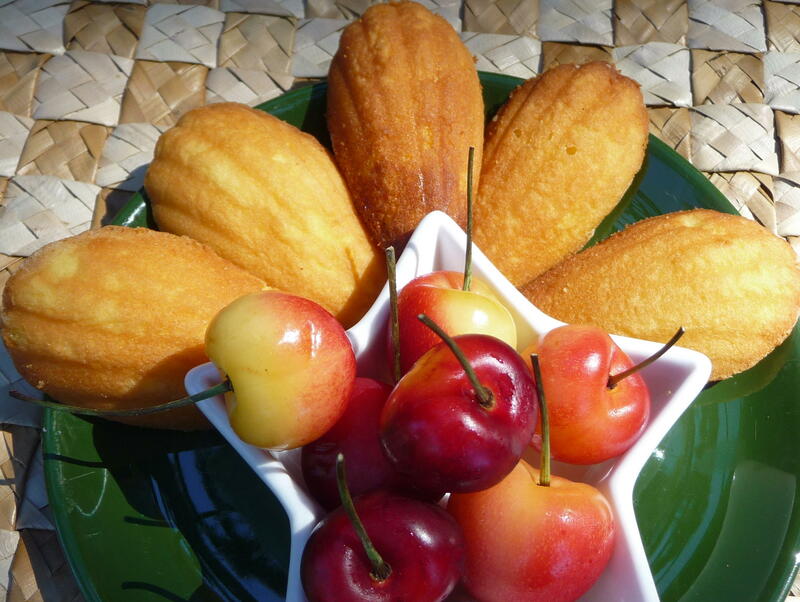 The madeleines were US $10/kg? That doesn’t seem too bad for a specialty baked good in the Philippines. Hi, Tan. Sawasdee krup! Thank you very much for visiting. I am so glad I found your blog now, as I love Thai food (I went to Bangkok, Suphanburi for meetings at the agricutural university, etc. It is nice to meet you via the food blog world. 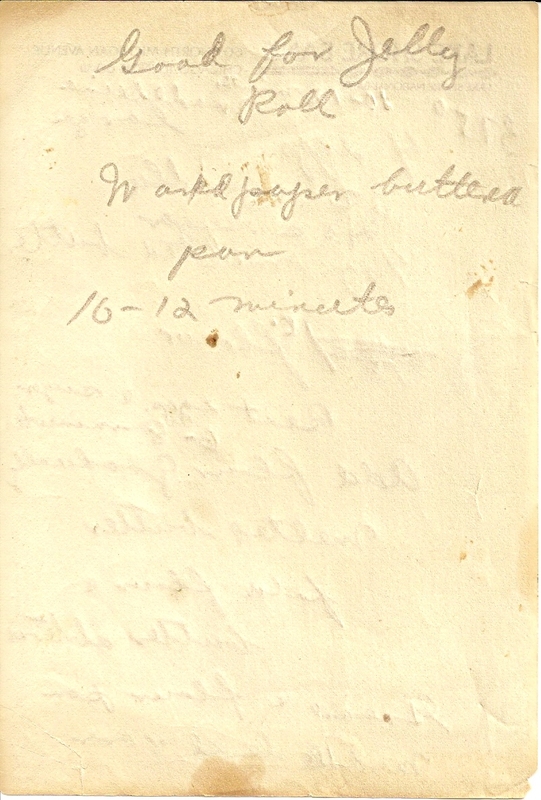 But more seriously, I absolutely love all the vintage photos and handwritten recipes featured here, and of course your lovely writing. So nice to have found your site! Thank you, Maddie. I do appreciate your very thoughtful comments. I am glad we are both on Ewa’s blogroll at Delishhh (I have enjoyed corresponding with her, too), so that is yet another cosmic thang. Our little Jinja is only eight pounds, while our other cat, George, is 16 pounds, but she is clearly in charge in the feline territory around here…. Sorry, I meant the Rainier cherries are US $12/kg (not $10, my conversion was off). Commercially produced Western baked goods aren’t too impressive here since real butter and vanilla extract are expensive ( by local standards) over here. I have to go to a 5-star hotels for any well-made pastry. KM, I just paid $5 or $6/lb for Rainier cherries up here (and WA state is not far) – so the $12/KG seems to be a bargain where you are. Why would you need Western pastries when you have anchovies adorning chocolate rice pudding? Well, if my parents nearly fainted at $12/kg, then I guess Rainier cherries are a bargain in California. They said they pay around $4.50/lb for theirs.